Montessori Children's House | Montessori Children’s House Celebrates with Play & Learn! Montessori Children’s House Celebrates with Play & Learn! Play & Learn Early Childhood Education Centers celebrated the 10th Anniversary of the Abington Gerstadt Center on May 14, 2014. Opened in 2003, the Gerstadt Center was designed as the exclusive child care center for Abington Memorial Hospital employees. Due to the growing need for child care in the Abington community, the Gerstadt Center then began accepting community families and has now grown to providing care for approximately 200 families. The 10th Anniversary Celebration event began with a guided tour of the beautiful Gerstadt Center, followed by some remarks from Play & Learn’s Director of Development, David Cooper and Executive Director, Judith Cooper. Play & Learn was honored to have State Representative Madeleine Dean present to share some remarks as well as Abington Memorial Hospital’s Director of Human Resources, Megan Patton. Nona Melnick, Principal of Horsham Montessori Children’s House was in attendance to show her support and love for education. Play & Learn current and former parents as well as members of the Play & Learn Board of Directors also attended this great event. 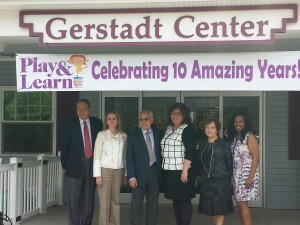 Congratulations to Play & Learn Gerstadt Center for providing 10 amazing years of quality early childhood education! Play & Learn is a 501(c)(3), equal opportunity, early childhood education organization that also provides management services to both the Blue Bell and Horsham Montessori Children’s House schools.